The Senior Officials’ Meeting (SOM) of the ASEAN Ministers on Agriculture and Forestry (AMAF) opened in Hanoi on October 8 to prepare for the 40th meeting of AMAF, the 18th AMAF 3 and the 6th ASEAN-China Ministerial Meeting on Quality Supervision, Inspection and Quarantine. In opening the SOM, Vietnam’s Minister of Agriculture and Rural Development Nguyen Xuan Cuong said agriculture continues to play a core role in the ASEAN Economic Community. Intra-bloc cooperation in agriculture is important for ASEAN countries in order to optimize the preferential mechanisms offered by various trade and investment deals of the ASEAN bloc such as the ASEAN Trade in Goods Agreement, the ASEAN Comprehensive Investment Agreement and the ASEAN Framework Agreement on Services. The minister noted that despite its advantages, the agricultural sector in the region has seen a slowdown in growth and faced many great challenges, particularly climate change, disadvantages in market, and a development gap with other regions in the world. Rapid urbanization and industrialisation in the region, coupled with poor administrative capacity also pose many problems for the sector. 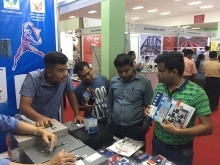 At the same time, the fourth industrial revolution has brought many new opportunities, he added. In order to tackle such challenges, ASEAN needs closer cooperation, which requires each member country as well as ASEAN as a whole to make strong commitment to and adequate investment in agriculture, and seek suitable solutions and steps to realise set targets. He expressed the wish that at this meeting, ASEAN members will debate and reach agreement on the region’s shared priority issues related to cooperation in agriculture, forestry, fisheries, and food security and safety, contributing to realising the ASEAN Community Vision and the Strategic Plan of Action on ASEAN Cooperation in Food, Agriculture and Forestry during 2016-2025. The minister added that ASEAN should also reach a common viewpoint on measures to cope with climate change in order to accelerate agriculture-related negotiations at multilateral forums, including those in the framework of the UN Framework Convention on Climate Change; mobilize society’s resources through Public-Private Partnership, and optimize opportunities brought about by the fourth industrial revolution, thus promoting development of rural areas. 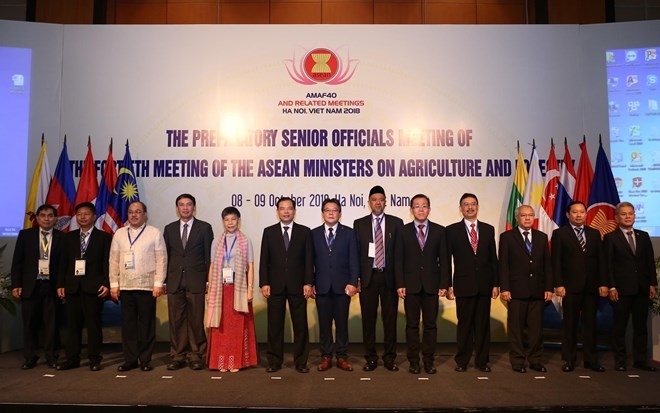 As host and Chair of the AMAF in 2018-2019, Vietnam commits itself to coordinate closely with ASEAN member countries and ASEAN Secretariat in carrying out cooperative activities to enhance ASEAN’s competitiveness and promote sustainable development of agriculture in the region, Minister Cuong told the meeting. He outlined priority contents in ASEAN cooperation in agriculture, forestry and fisheries in 2018-2019, including strengthening partnership and mutual support in building and developing sustainable and smart agriculture, adapting to climate change, ensuring food security, and attracting private investment from both inside and outside ASEAN to develop value chains in the farming sector towards raising the value of ASEAN farm produce and enabling ASEAN agricultural products to join the global value chain. Other priorities are to expand the PPP in agriculture and fisheries, enhance the role of the community and the private sector in responding to climate change and ensuring food security, encourage cooperation in scientific and technological research and application in agricultural, forestry and fishery production, and intensify collaboration in agricultural-fishery promotion in the region through joint training and the transfer of management, operation and supervision know-how for value chains and supply chains. The 40th AMAF is scheduled to consider and adopt 23 plans and documents in the field of agriculture and forestry. Meanwhile, at the 18th AMAF 3, Vietnam as Chair of the SOM-AMAF 3 will report on ASEAN 3 cooperation in food, agriculture and forestry, with three Memoranda of Understanding to be signed. At the 6th ASEAN-China Ministerial Meeting on Quality Supervision, Inspection and Quarantine, the coordinators of ASEAN-China SPS cooperation will present a plan of action for 2019-2020 for the meeting to consider and approve.